You want me to ask about what? Yes, we want you to ask, and talk, about colorectal cancer with your family. We know it's not one of those common topics of conversations, but it is important to know your risk. March is colorectal cancer awareness month, so it's the perfect time to ask your parents, children, and sibilings - have they had a colorectal cancer screening test? If yes, what was the outcome? If there is a history of colon cancer, or even colon polyps, in your family, you may be at higher risk of getting the disease. This is especially true if you have one or more first degree relatives (parents, children, or sibilings) with cancer or polyps diagnosed before age 60. Colon cancer is preventable, treatable, and beatable. It can be prevented by finding and removing polyps before they become cancerous and is highly treatable if found in its early stages. 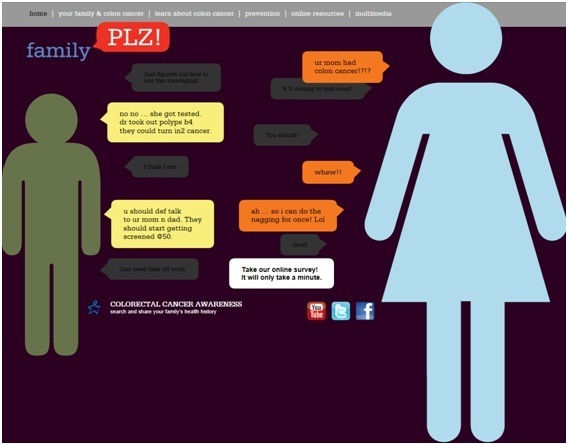 For information about colorectal cancer risk and family history, visit Family PLZ.